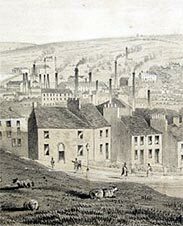 With the development of industry, the population of Burnley increased rapidly growing from just under 4000 in 1801 to almost 21,000 in 1851. What is today the town centre was quickly covered with back-to-back houses, tenements and cellar dwellings. Conditions in these homes were indescribably bad. Often a family lived in one room that was dark, airless and damp. There was no adequate water supply and poor sanitation.